This chapter will include all of those static interactions that can in some way effect the total energy of any given level of an atom or ion of interest. That’s a tall order. 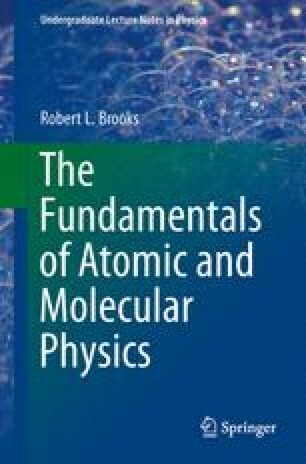 Consider that the total energy of an atom is known, having solved the problem presented in the previous chapter; that is, all of the electrons are in stationary states about some nucleus, with the only interactions being electrostatic attraction to the nucleus and repulsion to other electrons. The solution to such a problem would have ignored additional interactions. The largest, and one alluded to in previous chapters, is the fine-structure interaction. This is the coupling of the angular momenta of the outer electrons, the ones in open subshells. All filled shells and subshells have zero total angular momentum, so those electrons cannot take part. Whichever way one chooses to couple the angular momenta, and there are many different possible ways (Russell–Saunders coupling being just one), the total angular momentum, J, is a good quantum number.